Gap pads or fillers provide an effective thermal interface between heat sinks and electronic devices where uneven surface topography , air gaps and rough surface textures are present. These filled silicone polymer sheets are used to provide thermal solutions when interface gaps are greater than 0.5mm. They are easy-to handle, re-workable and excellent for complicated die cut shapes. They offer good compression for stress relief and shock dampening. Pronat offers a full range of thermally conductive materials as shown below. These materials have been selected for their excellent conductivity rating ( W/m-K) for each thickness sector, soft/hard parameters and consistent durability under stress. Pronat stocks and converts gap fillers from world leading manufacturers for a wide range of electronic applications. These standard or fabric reinforced silicone polymer sheets are used to provide thermal management solutions where interface gaps are less than 0.50mm. These materials can be used for low cost thermal transfer requiring minimal thickness, high physical and mechanical characteristics. The fiberglass/silicone compound construction provides excellent cut through resistance, good thermal conductivity and excellent electrical insulation. Availability: Cut sheets and die-cut parts. Thermal phase change materials are solid pads at room temperature that melt at preset operating temperatures above 50°C and provide complete wet-out of the interface, thereby eliminating any air gaps. Electronic modules for power devices power supplies. These materials are screened, stenciled or dispensed and require virtually no compressive force to conform under typical assembly pressures. 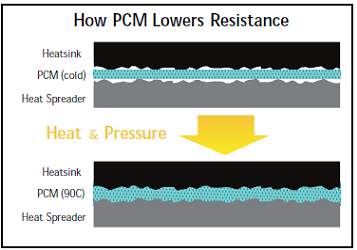 Good surface wetting results in low interfacial resistance. Rather messy to apply for low volumes, for large quantities an automatic dispensing system is normally used. Clean removal is difficult. Excellent surface wetting, can be implemented by automatic dispenser, low compressive force, cost effective. Thermally conductive pressure sensitive adhesive tapes provide solutions for difficult thermal management challenges. These products can be used in place of mechanical fasteners, provide excellent thermal coupling between components and heat sinks and can accommodate materials of different coefficients of thermal expansion with the compliant interface. All of the adhesives are flame retardant and are formulated for high performance adhesion while still being easily re-workable without damage to sensitive components. Thermal tapes are used in place of mechanical fasteners to join heat sinks to computer processors, or to electrically isolate components of a power supply while still providing an excellent thermal conduction path. Type: aluminum and copper foil, graphite paper, transfer adhesive tapes. Benefits: No need for mounting holes/screw to clamp, easy to apply. Pronat stocks world class thermal management materials.